It’s been an absolute pleasure presenting a season of wine tastings to small groups of Swedish visitors enjoying the activity holidays organised for them by Milagro Javea. However, all good things must come to an end – well for this season, that is! Bookings are already being taken for dates organised this far for 2019 and I’m delighted to say my services have been retained. 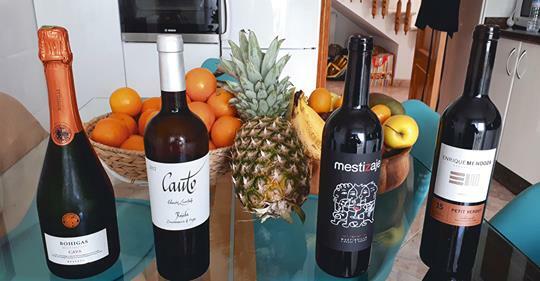 As I said in the first article this season, when I’m presenting wine tastings with people who don’t live here in Spain, I like to introduce them to indigenous grape varieties as well as international ones. Also, I like to present wines from the famous areas of production, varying these each time, of course. I’m also a great fan of wines made locally, believing in fact that is really is incumbent upon me to make sure that visitors are introduced to the delights of wines made, perhaps within even a thirty minute drive. Quite how it is that some visitors to Spain eat at McDonalds, when there is such a wealth of wonderful Spanish food here, is beyond me! Sure, you might not like it all, but at least try it! Well, we’re all different I suppose. So, if thinking of the really famous areas of wine production, Rioja would come to mind of course. Ribera del Duero, Cava and, although we haven’t yet used them, Sherry, would all fit into the super-famous category. And when you consider that for me, starting a tasting (just as when thinking of an aperitif before dinner) with something sparkling, it’s no wonder that all our Swedish friends have been initiated into the world of Spanish fizz – in this case, of course, Cava! We’ve enjoyed a number of the whole season, the latest, the one we used for the final tasting of the season was Bohigas Reseva Brut Nature (my favourite style of fizz, the driest). Made with a winning combination of the international Chardonnay as well as the Spanish Macabeo, for it’s acidity and green apple aromas and flavours along with Parellada, for a floral presence and some elegance too. I feel it is very important to explain that there are different styles of Cava, as this can be quite confusing, and can result in people tasting really quite inappropriate, cheap cavas, in my opinion, unworthy of the name! So, we chose a Reserva, a style of cava that retains the important celebratory element whilst adding a different dimension for depth of flavour weight an presence, giving further pairing possibilities. For our white wine, we chose an area which, in Spain, is certainly famous, but this fame isn’t universal – our Swedish friends, mostly, haven’t come across it. DO Rueda from whence came the Verdejo, the indigenous variety of the area, is a rags to riches story. Their local grape tends to oxidise far too easily and therefore didn’t generally give of its best. New technology, huge investment and a lot of hard work and experimentation has pushed this variety into one of the best for white wines in Spain! I liked this one because it was one of the more subtle examples, rather than the in-you-face types that are pleasant, for one glass, but over-kill for another. Our first red (I always like to have more red wines than the others, Spain, still being recognised as a red wine country first), was the flamboyantly labelled Mestizaje Bobal. In fact, although the name would suggest so, it isn’t a monovarietal. Garnacha and a little Syrah join the party, and the finished product is a lovely fruit-first red wine. The vineyards are 800 metres above sea level – I’ve visited the bodega in February, and I can tell you, it’s freezing in the winter! More importantly, during the growing season there is a considerable drop in temperature at night and amongst other delights this adds a certain brilliance to the wine in the glass! This wine is notable as well, because it isn’t consistent – and I mean this in a complimentary way! Whilst the blend this year is as above, it may not be next vintage, a fact of which I thoroughly approve. The final blend each year, in terms of percentages and varieties will vary – it will depend on how well the various varieties have fared that year. Wine is a product of nature, and shouldn’t therefore be interfered with too much! So, our final wine of the 2018 Swedish season, was one that is made in a bodega a matter of just half an hour away from the font line villa in which we enjoyed the wines. Bodegas Enrique Mendoza, as many readers will (and indeed, should!) know, produces a series of wines of the highest DO Alicante order. The choice, therefore, was actually quite difficult, but I settled on their Petit Verdot – such value for money, and the chance to show how well the variety can ripen in the Spanish Sun! Next Next post: The Final Wine Tasting Lunch of 2018!